The violent clashes in Charlottesville on August 12 turned the spotlight on freedom of speech across the nation, with many asking just how much hate speech is covered under the first amendment. And just over a week ago, Richmond experienced a neo-Confederate rally on Monument Avenue, once again helping to push the idea of free speech and its limits to the forefront of the national conversation. Several hot takes, think pieces, and editorials have thus come out recently on this very topic. One in particular, from the Washington Post, caught my attention here in Richmond. Catherine Rampell laid out her findings from what she called a “disturbing new survey of students” conducted by John Villasenor, a Brookings Institution senior fellow and University of California at Los Angeles lecturer. As a young person, I had some problems with her analysis, especially when applied to the context of the Commonwealth. Several of these questions apparently “were designed to gauge students’ understanding of the First Amendment.” Rampell noted one question in particular, pointing out that four in ten students said no when asked whether the First Amendment protects “hate speech.” She continued, explaining that speech based in hatred — or at least, speech perceived as such — is constitutionally protected, despite its ugliness. Okay… but that’s not the whole story. Not in the age of Charlottesville, and not when white nationalists occupy senior positions in the White House. First, many of the tactics that critics (like Rampell) complain about are themselves speech. When activists denounce alt-right provocateurs like Milo Yiannopoulos as a racist or Richard Spencer as a white nationalist, they are exercising their own right to free expression. Just the same, when students put on protests or marches, launch social media campaigns, circulate petitions, boycott lectures, apply pressure for the resignation of professors and administrators, or object to the invitation of controversial speakers; all of this is a form of expression, something Rampell would do well to understand. It should also be noted that this study has now been refuted by some experts in the field of statistical science. Cliff Zukin, a former president of the American Association of Public Opinion Polling, called this particular study “junk science.” And it was also reported by The Guardian that the study did not include a peer review process, and was the first study ever conducted by its author. Still, with influential publications like the Washington Post and the Wall Street Journal citing its findings, the sentiment in the article is worth exploring. Again, Rampell fails to understand that counter-speech can be produced in many fashions, as it has been here in the Commonwealth. It can be a point of fact aimed at debunking a speaker’s claim. It can be an opinion that the speaker’s view is misleading, ignorant, offensive, or hateful. It can even be accusatory, claiming that the speaker is racist or sexist, or that the speaker’s words amounts to an act of harassment, discrimination, or aggression (looking at you, Milo and Richard). Rampell or others may argue that these communications tactics aren’t attacking “the merits” of the speech, but she’s once again misguided in that assumption. Arguing that a speaker’s stance is racist or sexist is to say something about the merits of their position, given that the majority agree that racism and sexism are bad. Even arguing that the speaker themselves is racist does indeed go to the merits, since it gives the public context for judging the motives and implications of the speaker’s viewpoint. 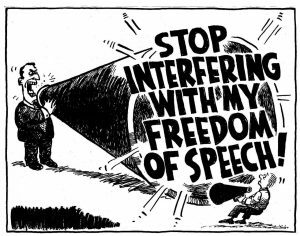 Besides, what principle of free speech limits discussion to the merits? Political discourse quite often deviates from the merits of “the issues” to personal or divergent matters. Rampell views this as “liberal intolerance,” but once more, that’s disingenuous. Insults, shaming, demonizing, and even social ostracism are not unreasonable consequences for speakers to expect and bear. Sure, the Constitution allows Westboro Baptist Church and Richard Spencer to hold forth, but it does not protect them from the consequences of their words. In 2017, we all live a political lifestyle. One where politics dominates most aspects of our public and private lives; who we chose to interact with, be friends with, and associate with. The news cycle governs the direction of our conversations, while the intellectual contest between party affiliations has become a modern gladiatorial sport. The arena has never been more dangerous for those seeking public office. Which is what makes Cliff Hyra, the Libertarian candidate for Governor, so interesting. While he is the underdog in the Virginia Governor’s race, the 34 year old lawyer from Northern Virginia is already having an impact. In Virginia’s contested gubernatorial race, where the margin of error remains competitive for both establishment candidates, Hyra’s support for the legalization of marijuana, criminal justice reform, and opposition to the Atlantic Coast and Mountain Valley Pipelines has the potential to make or break either candidate. 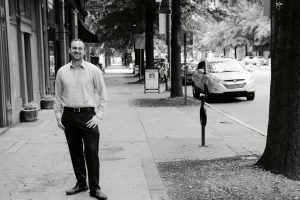 RVA Mag’s Political Director, Landon Shroder, caught up with Hyra at Quirk Hotel in Richmond for a coffee and to chat about Libertarianism, young people in politics, and of course, marijuana. Shroder: You are 34 years old. What compelled you to undertake the grueling punishment that is required to run for elected office? Hyra: I’ve lived here my whole life in Virginia and have three young children, soon to be four. I am very invested in the future of the Commonwealth and I wasn’t too crazy about the other candidates that were out there. It is really important to me that there is a third option for people like me, who were not satisfied. Some of the ideas out there, the other candidates were not talking about: regulatory reform, supporting small businesses, criminal justice reform. So this was a good opportunity for me to get my voice heard and try to improve things for everyday Virginians. Shroder: Young people are drastically under-represented in politics. Given your age, and we’re roughly the same age, how will you better represent those of us who are looking for a new style of politics? Hyra: I’m brought up here in Virginia. I run a business. I have a law practice and have young children. I understand what it is like to raise a young family in today’s age and I think I can do a better job representing the interests of other people who are in a similar situation as me. They are not retired, [don’t] have adult children, and are in the middle of their careers, in the middle of raising their family. So I understand what is lacking in Virginia and what we can improve, which maybe the other candidates don’t have that kind of perspective. Shroder: For most people, Libertarians are just a reinvention of a certain wing of the Republican Party, a course correction from the worst excesses of what conservatism has become. True or false? Hyra: I would definitely say that is false. I’ve never been a Republican. When I was a child I probably considered myself a Democrat. But I’ve pretty much been a Libertarian all my adult life. I don’t feel any kind of affinity for either of the other two parties. In my opinion, we are on a whole different axis. We are not about left or right. We pick issues pretty equally from the left and right. We are about economic freedom and personal freedom and there is a real consistency there that is separate from any concept of conservatism or progressivism. So I don’t consider myself part of any of the other two parties. Both of the parties accuse us of drawing people from their parties, so I get it from both sides. That is a pretty good indication that we are really in the center now and more mainstream. Shroder: Do you find that young people are receptive to the Libertarian message? Hyra: I think so. They seem to be receptive. I think they [young people] are less socially conservative. And of course personal freedom is also an important part of Libertarianism, and they are drawn to that. Shroder: You ready for some hard questions? Hyra: Oh yeah, let’s do it. Shroder: On taxes, you propose an exemption for the first $60,000 of household income. Kansas proposed a similar plan and it almost bankrupted the state. Their legislature just voted to resume collection of income taxes, so why would your plan work in the Commonwealth? Hyra: I am not sure how similar the plans is in Kansas. But we have an outrageously bad tax code here in Virginia. The top tax rates starts at only $17,000 a year and that is out of step with the rest of the country. If you look at someone who is making $30,000 a year here in Virginia, they are paying more than twice as much here as they would pay in California, which is known as a pretty high taxed state – if not the highest. So there is a lot of change that is needed in the tax code. It is not that big of a hit fiscally. It is only between three and a half and four billion dollars, which is about 8 percent of the budget. Of course the budget has increased by 20 percent over the last few years. So even rolling it back by that amount, we would be back to 2014 levels of spending. And I have a plan on how I would pay for it. Of course in Virginia we are constitutionally required to have a balanced budget, but we’re expected to have some natural growth in revenue over the next couple of years as a matter of population and economic growth – a couple billion dollars just from that. There are a number of tax loopholes that are also costing the Commonwealth about 600 million a year in tax revenues. I’m also proposing to legalize marijuana. If we are drawing from the experience we’ve had in Colorado, we can estimate that we’d have about 200 million in additional tax revenue from that. And I’m also looking at comprehensive criminal justice reform…the estimated savings are between 500 million and a billion. Shroder: Since you just brought it up, you’re a serious proponent of criminal justice reform and one of those planks is not just decriminalization, but legalization of marijuana? Hyra: Decriminalization is a start, but we have some form of legal marijuana in 29 other states and the District of Columbia. And we’ve seen the results, and they are very promising. This is not an untried experiment. I have no interest in turning Virginia into some kind of hotbed of libertarian experimentation. I would be satisfied with being a little more innovative, a little less hidebound, and take some of the policies that have been proven to work in other places, so we can experience some of the same benefits that other states have. There are a lot of benefits you have from full legalization. Of course you have additional industry in people growing, manufacturing, and turning hemp and cannabis into usable products. So you get the whole business aspect to it, in addition to the tax revenue. There is no reason, in my opinion, for it to be criminalized. Shroder: Do you believe racial disparities and systemic racism plays a role in the Commonwealth’s over-imprisonment and the way marijuana laws are enforced? I did not see that mentioned in your platform. Hyra: It is hard to separate it out, what is the result of racism. Certainly there is disparate impact on African American communities, minority communities, and disadvantaged communities. This is a huge aspect of the issue for me. The most effective way of addressing that is with comprehensive reform. It is to hard to regulate at a micro level. You have this issue with marijuana, where African Americans are arrested at two or four times as high a rate as white people, yet surveys show the rate of use is about the same. Obviously that is a problem. I can’t say conclusively what’s the reason for that, I have not read any studies. Is it because the police are racist? I don’t know. But if you make marijuana legal, it solves part of the problem. There are certainly other aspects which are more targeted to that, such as sentencing disparities and reforming some of the felony classifications. You can make things better for everyone without turning it into a culture war issue, which makes it more difficult to achieve real results. Shroder: You took a position on the Atlantic Coast Pipeline. Do you support eminent domain for projects that surround critical infrastructure development? Hyra: I’m not sure that’s the way I would phrase it. We have eminent domain in the Commonwealth, but it was reformed after [Kelo] which was a Supreme Court decision that confirmed the government could seize private property and give it to a private company if they think it will create jobs. Many people were not happy about that. You are taking away property from disadvantaged communities, a lot of whom are less politically powerful. And it is amazing how often things don’t pan out and the company ends up building nothing and no one gets any jobs. We need to narrow the scope of what is a public need and a public use. That’s the whole idea. If you are going to take someone’s property against their will without their consent, then there needs to be really compelling need for it. It needs to really benefit the public. In most cases pipelines don’t satisfy that requirement. A road can be described as quote-unquote “critical infrastructure.” It is something the public uses and no one owns it. Electrical power is something that is critical and everyone uses, and if it is owned by anyone its a government regulated utility. When talking about a pipeline, only a private company is going to use it and there is no guarantee that there will be any benefit to the people of Virginia – any direct benefit. The whole idea is that they are building this pipeline to carry natural gas to a port so they can ship it somewhere else. I don’t think that qualifies. I have no objections for eminent domain for narrowly tailored public needs and uses. For this, I don’t think it is appropriate. The only reason it is legal is because the federal government is doing it, and they did not enact the same reforms that Virginia did. Virginia would not be able to do this under Virginia law. Shroder: Would you come out and say you are against the pipeline? Hyra: I am against the pipeline, absolutely. ACP and MVP, I am against it. I was just in Glassburg this weekend and of course there are a lot of people out there who feel very passionate about it. One of the issues is that from the standpoint of Virginia, our role is to review the environmental concerns. And I think [with] the use of eminent domain across a huge part of the Commonwealth, you should be making sure that these companies are not being cut any special breaks. That is one of the biggest concerns. Dominion Power is so big in Virginia and has donated to so many political campaigns, and large amounts of money to both of the other candidates. The concern is that they are getting special treatment. There is good reason to believe that. Shroder: How come climate change is not one of your main priorities? Hyra: Well climate change is something that requires a lot of coordination. It is something that is difficult to do at a state level. So it is an important concern, but the better the situation we are in economically, the better the position we are going to be in to address that [climate change]. If there are cutbacks and regulations that need to be made to reduce pollution and cut Co2 output, then we will be in a better position if our economy is stronger. That is what I have focused on. Shroder: But sea level rise in Coastal Virginia is at a rate of 3 to 1 above the national average. The Navy is already saying that they might have to pull out of Norfolk because of it. Doesn’t that constitute both an environmental and economic crisis for the Commonwealth? Hyra: Absolutely it does, but there are local issues that are a result of global warming – the most prominent being flooding. That is something that needs to be addressed and is something I am working with our House of Delegates candidates in the Norfolk area on, to come up with a plan to address. In the past we’ve not always had developers, city governments, and property owners on the same page. As far as developing in a smart way that is going to have less exposure to flooding, we need to make sure infrastructure is done in a way to accommodate that. As far as root causes, we only have an infinitesimal portion of the responsibility for that. Any change we would make in terms of reducing the amount of pollution made in the state of Virginia is going to have a vanishingly small impact. We are interested in the practical impacts resulting from climate change and our role is to mitigate that for the citizens of Virginia. Shroder: One of the big questions voters want to know is, what level of participation should the Commonwealth have with President Trump? Should Virginia be as flexible as possible to current policies? Hyra: The Trump question is a very strange one to me. I get people all the time asking me if I support Trump. That is a weird question to me. What does that mean? I don’t support anyone without reservation, no matter what they’re doing. I support people when they deserve support and oppose them if they are doing something I oppose, even if they are a good person. A big part of my philosophy and why I’m a Libertarian is respecting people who are different from you – even if you have a different background or belief, even if you disagree with what they’re doing. Respecting their right to make their own choices about their life has drawn me to the party. This is also something I try and cultivate in my personal life, and is something that I dislike about Trump. I don’t think he is respectful. I don’t think he has a respectful tone or treating people with respect, which is discouraging. A lot of his positions are wrong, but at the same time I am trying to be charitable to those I disagree with and people I don’t like. I can disagree very forcefully with their policies without necessarily making it about them, personally. What I think about Trump personally is not really an issue, but I’m gonna work with him if I can on something that makes sense. And if there is something that doesn’t make sense then I’m gonna oppose it as forcefully and strongly as I can. At the same time, for something that I think is a good idea, it would be crazy to turn it down just because of the person associated with it, or behind it. Shroder: You have a campaign plank about food and beverage in Virginia. Do the current laws stifle job creation and economic growth? You’ve talked to a half dozen people in this town and they’d all have investment if it wasn’t for arcane liquor and food laws. Hyra: I do think so. What I have heard from some people is that many years ago when prohibition was ending Virginia was a much more conservative place. So they were trying to craft some rules that would discourage what they considered scandalous behavior. These are rules that have been on the books for a long time. So even if you were very socially conservative, and agreed with those goals, they would be a bad way to achieve them. Obviously at that time they did not have the sophisticated analysis that we have today, where they can look at the impact of these rules. I’m not sure why we still have them. I know with criminal justice there is a perspective of not wanting to look soft on crime. And you have a few Republican legislators that are very prominent and have chairs on important committees, and they can prevent this. But the other side is, what is the constituency for that? It may be competing industries. I’ve heard sometimes the restaurants will support these regulations because they make it harder for bars to compete with them. Once something gets entrenched, people come out of the woodwork to support it because it favors them in some way. But I absolutely think there are vestiges and holdovers from an antiquated era and we have a lot of them in Virginia. We are one of the oldest states and we have a lot of old-timey things that are way out of step with the rest of the country. That’s why I wish we could be a little more innovative. Shroder: Any final message for our readers? Hyra: If you’re interested in my campaign, we are as open as we can to the public and we want people to reach out. I hope to meet all of you out there, and meet constituents and what is of concern to you. Sometimes people have really great ideas, and I incorporate them in my platform.